Recently I got the opportunity to try out the new Milani Cosmetics Limited Edition Texture Creams Nail Polishes, these are being released in March and the colors bring a feel of spring to the drab winter days. To remove, soak a cotton ball with acetone based nail polish remover. Allow to set on the nail for about 20-30 seconds and wipe outwards, away from the nail bed. Turn the cotton ball over and remove any excess on the sides of the nail." Ethyl Acetate, Butyl Acetate, Nitrocellulose, Polyethylene, Adipic Acid / Neopentyl Glycol / Trimellitic Anhydride Copolymer,Isopropyl Alcohol, Propyl Acetate, Trimethyl Pentanyl Diisobutyrate, TriphenylPhosphate, N-Butyl Alcohol, Stearalkonium Hectorite, Stearalkonium Bentonite, Benzophenone-1,Citric Acid, Dimethicone. +/-May Contain: Black 2 (CI 77266), Mica (CI77019), Bismuth Oxychloride (CI 77163), Titanium Dioxide (CI 77891), Red IronOxide (CI 77491), Black Iron Oxide, (CI 77499), Ferric Ammonium Ferrocyanide (CI77510), Yellow 5 Lake (CI 19140), Red 6 Lake (CI 15850), Red 7 Lake (CI 15850), Red 30 Lake (CI 73360), Red 34 Lake (CI 15880), Aluminum Powder (CI 77000), Polyethylene Terephthalate, Blue 1 Lake (CI 42090). I really love the colors they have chosen, it brightens up the current drab winter mood and makes me think of Spring. The texture is really neat looking and the pigmentation of the polishes are really strong with just a single coat. 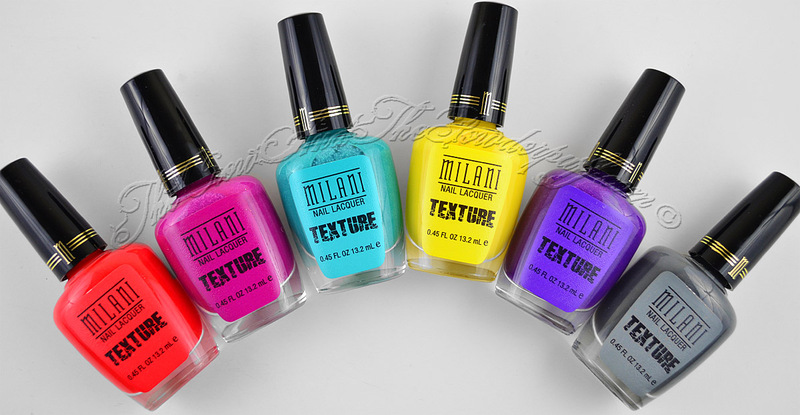 I would definitely suggest picking these up if you love polishes and since they are Limited Edition that is another reason to grab them fast. Price: $4.99 for 0.45 fl oz. / 13.2 ml. Do you plan on picking these up? What's your favorite color(s)? Great! I really wanna try this finish out! Purple streak is really pretty!! The colours are pretty cool but i don't like uneven nailpolish.